Mercury Jets is an on demand air charter provider specializing in private jet and turboprop charters in Oakland. Our team is composed of industry leading professionals dedicated to providing our customers with the ultimate air charter experience. We are committed to safety, reliability and white glove customer service. To obtain a charter quote tailored to your specific needs, please fill in the request form or call our agents 24/7 at +1-954-359-0111. Mercury Jets offers private jet charter services to and from Oakland, CA, USA. Oakland is the city in the state of California situated on San Francisco Bay about eight miles east of the city of San Francisco. Rich history, warm climate, diverse community, historic architecture, beautiful parks and open spaces, sightseeings, vibrant nightlife, recreations facilities and excellent restaurants make Oakland an enjoyable destination for visitors from all over the world. The most famous tourist attractions are the Jack London Square, the Chabot Space and Science Center, the Knowland State Park Arboretum, Lake Merritt, the Preservation Park, the Fox Oakland Theater, the Oakland Museum of California, and the Art Deco Paramount Theater. 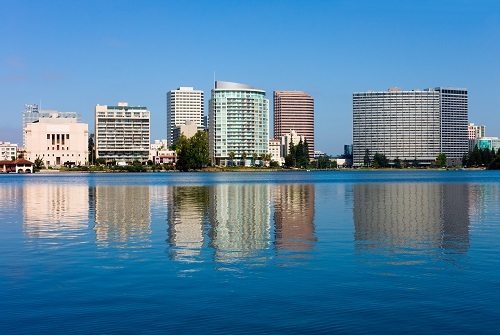 With Mediterranean climate, Oakland has something to offer for everyone from biking and hiking to water-based sports. In addition, Oakland has some great walking tours that being conducted daily from May through October including the tour of Lake Merritt, and the walk through Preservation Park. Executive Inn & Suites, 1755 Embarcadero, Oakland. The Washington Inn, 495 10th Street, Oakland. Waterfront Hotel, 10 Washington Street, Oakland. Lake Merritt Hotel & Apartment, 1800 Madison Street, Oakland. Marina Village Inn, 1151 Pacific Marina, Alemeda. The Inn at Jack London Square, 233 Broadway, Oakland.